Does Science Advance One Funeral at a Time?, by Jay Fitzgerald: Knowledge accumulation — the process by which new research builds upon prior research — is central to scientific progress, but the way this process works is not well understood. In Does Science Advance One Funeral at a Time? (NBER Working Paper No. 21788), Pierre Azoulay, Christian Fons-Rosen, and Joshua S. Graff Zivin explore the famous quip by physicist Max Planck. They show that the premature deaths of elite scientists affect the dynamics of scientific discovery. Following such deaths, scientists who were not collaborators with the deceased stars become more visible, and they advance novel ideas through increased publications within the field of the deceased star. These "emerging stars" are often scientists who were not previously active within that field. The results suggest that outsiders to a specific scientific field are reluctant to challenge a research star who is viewed as a leader within that field. The authors tracked the publication records of scientists — both collaborators and non-collaborators — before and after a "research superstar" died. To narrow the scope of their study, they focused on academics in the life sciences, a sector which is heavily supported by National Institutes of Health funding and produces a high volume of research. They established a list of 12,935 elite scientists using criteria such as the amount of research funding received, publication citations, number of patents, membership in prestigious organizations, and career awards and prizes. They then examined records of 452 of those elite scientists who died prematurely — before retiring or becoming administrators — between 1975 and 2003. Publication data was gathered from the National Library of Medicine's PubMed service, which indexes and tracks articles by research topics, names of authors and coauthors, citations, related articles, and other information from 40,000 publications. 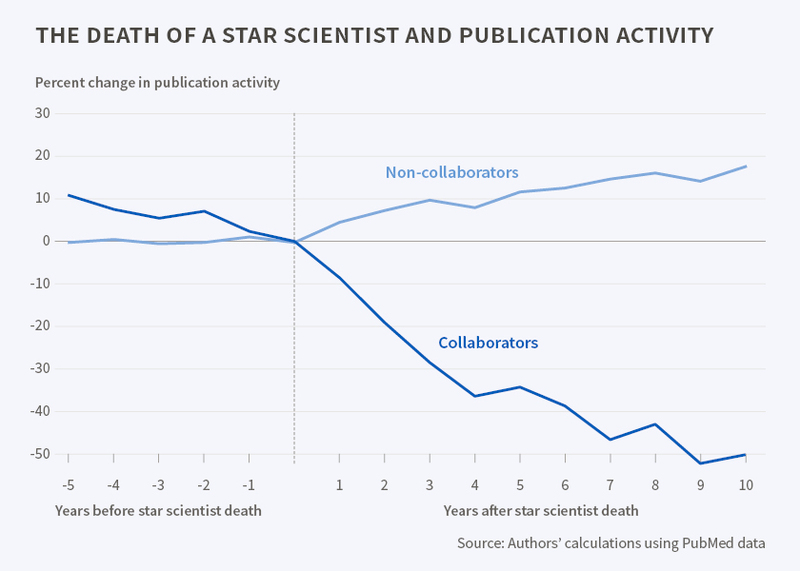 The findings confirm previous work showing that the number of articles by collaborators decreased substantially — by about 40 percent — after the death of a star scientist. Publication activity by non-collaborators increased by an average of 8 percent after the death of an elite scientist. By five years after the death, this activity of non-collaborators fully offset the productivity decline of collaborators. "These additional contributions are disproportionately likely to be highly cited," the researchers found. "They are also more likely to be authored by scientists who were not previously active in the deceased superstar's field." Few of the deceased scientists served as editors of academic journals or on committees overseeing the issuance of research grants, so the researchers rule out the possibility that the deceased scientists used their influence to limit who could or could not publish their work or receive grants within their field. Instead, they say, the evidence suggests that outsiders were reluctant to challenge the leadership within research areas in which an elite scientist was active. While entry occurs after a star's passing, it is not monolithic. Key collaborators left behind can regulate entry into the field through the control of intellectual, social, and resource barriers. "While coauthors suffer after the passing of a superstar, it is not simply the case that star scientists in a competing lab assume the leadership mantle," the authors conclude. "Rather, the boost comes largely from outsiders who appear to tackle the mainstream questions within the field but by leveraging newer ideas that arise in other domains. This intellectual arbitrage is quite successful — the new articles represent substantial contributions, at least as measured by long-run citation impact."